We give the Hamilton Beach 70670 Chef Prep a rating. 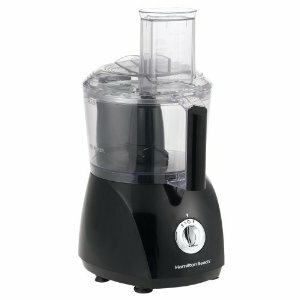 The Hamilton Beach Food Processor is good sized for a small family. It is very versatile; you'll be surprised at how many different ways you will use this machine. It slices, shreds, and chops. The oversized feed chute eliminates wasted time spent chopping vegetables into smaller pieces before using the machine. The bowl, lid and blades can easily go in the dishwasher. The cord can be stored inside the unit, leaving your kitchen counter cord free. The Hamilton Beach Food Processor makes food prep much easier. Instead of spending hours chopping foods for preserves or before a complicated meal, you can do it easily in minutes or even seconds. This machine handles more liquid than some of the larger machines without leaks. The price point makes it an affordable choice. The blades are clearly marked, making their use a snap. Clean up is easy. You don't need to worry about the machine wobbling during processing; suction cups on the base hold it securely to your countertop. Hamilton Beach does not use BpA plastic in the bowls of their food processors. If you like to make sauces, this unit will perform beautifully. The Hamilton Beach Food Processor may not handle cheeses very well unless you cut them up in smaller pieces first. You have no choice on slice thickness. Purees may come out a bit grainy. Soups must be done in tiny batches to smooth them. Some customers did not find this processor to be worth the price, saying it rocked on the counter during use; the lid did not lock well and has few uses where it will perform as expected. The Hamilton Beach Food Processor has a lot of satisfied customers. Even so, there are a few who feel this inexpensive processor is not worth the money. Ultimately, it is up to you. With many satisfied customers, the chances of getting a lemon are small. If you only have a small family or couple to cook for, this food processor may be the perfect choice for you, especially if you are on a limited budget. You will need to precut your foods before processing, but it may be worth it to get the even chopping you can get with a food processor. It works well for liquid, fruit and many other applications. If you are concerned about the use of BpA plastic, this can also influence your choice. Many customers found it handled cheese fine as long as they helped stabilize the base. Cleaning up afterwards is simple and many parts can go in the dishwasher. It is also a good size for storing when not in use. Overall, it seems a decent food processor for the price point. At the time of writing this review Amazon had this food processor discounted 38% for $37.03.